What comes to your mind first when you think of cleaning your room? Is it the time required to clean or the overwhelming process? What do you think of the stuff in your room? You can clean all the mess in your room and get anything you need fast. Below is a useful guide on how to clean your room really fast. Before you start cleaning, identify the biggest offender. This could be piles of shoes, half-empty glasses and crusty dishes under your bed with a awful smell, crusty underwear, which could all lead to lack of floor space. Identify the most shocking thing in the room even if it is a shared room. Collect all garbage in your room and put it in a bin or the kitchen trashcan. And take all dirty dishes and glasses to the kitchen. You can either wash them or place them in the dishwasher. The second tip on how to clean your room fast is to hide away all your personal stuff. Put away anything that you do not want your visitors to see when they come into your room. Some of the embarrassing items include foot fungus cream, used Q-tips, dental headgear, prescription bottles, and digestion aids. Others include a singing toothbrush, a netipot, a notebook with your crush’s name, etc. Open all windows and door even if it is cold outside to allow fresh air to circulate your room. You can spray a squirt of your perfume while standing at the door. Fan the spray so that it circulates in your room and gives your visitor a first impression of a good smell. Alternatively, you can spray an air freshener when your room is aired out. A nice smelling room feels clean even before you clean it. Do not spray the room with dirty clothes inside. Dirty laundry is the major source of a bad smell in your room. If you want to learn how to clean your room fast, start by making your bed. Your bed occupies the largest part of your room. A well-made bed gives an impression of a tidy room. You do not have to spend a lot of time on it. Just spread the sheet and the coverlet fast. Avoid sitting on the bed after. Or you can place a book, laptop, or collage next to your pillow to show that you were busy doing something great. Pile any toys or books around their rightful place. Collect all items that should not be in your room and take them to the right places in your house. 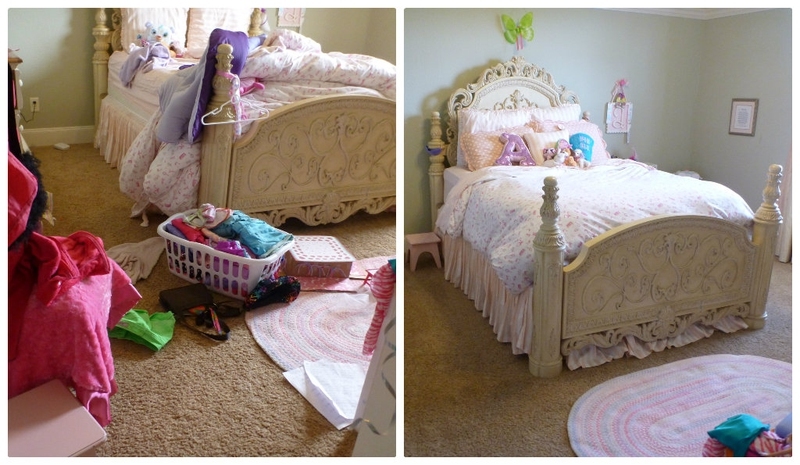 For instance, take all items that belong to your siblings or children to their respective rooms. Take all books in your room to your living room. Washing your clothes is a critical step in this systematic guide on how to clean your room fast. Separate all dirty clothes from clean clothes. Put the dirty clothes in your hamper or wash them. Fold clean ones neatly before placing them in a dresser to create room for more clothes or just hang them in the right place. Put your shoes away and hang your belts, ties, and handbags in your closet. Cleaning your room goes beyond the obvious items like dirty clothes and garbage. Clear any clutter and organize the surfaces such as bedside table, desk drawers, and your dress. Check for clutter under the bed as well. Give away items you no longer need such as toys, clothes, and books. You will create more space to store the things you need. In this case, cleaning and organizing the items that you use will be easier. Recycle unneeded papers and organize the rest. If you are a student, put all loose notebooks and bots in a special folder or box. You can check the box or folder later and throw away what you no longer need. Place small items in storage boxes or bags and then put them under your bed, on your dresser, or in your closet. Put similar items in one place when arranging your room. Vacuuming is the last step on how to clean your room fast. Vacuuming will make your room look clean. A dirty floor or carpet makes a clean room appear dirty. Vacuum the edges and corners of your room and under the bed. If your floor surface is hard, sweep or mop it because your vacuum cleaner will not pick all the dirt. Server responsed at: 04/19/2019 4:43 a.m.